Are you listening, possibly entering and influencing the dialogue? Devoid of conscious reasoning, your gut instinct will make you know. Just “know”, no thoughts involved. More often than not, your gut seems to be more responsive and faster than your brain, with reactions coming to the fore e.g. via “butterflies” when it comes to amorous affairs, queasiness when it comes to uncomfortable situations or even unwanted discharges. 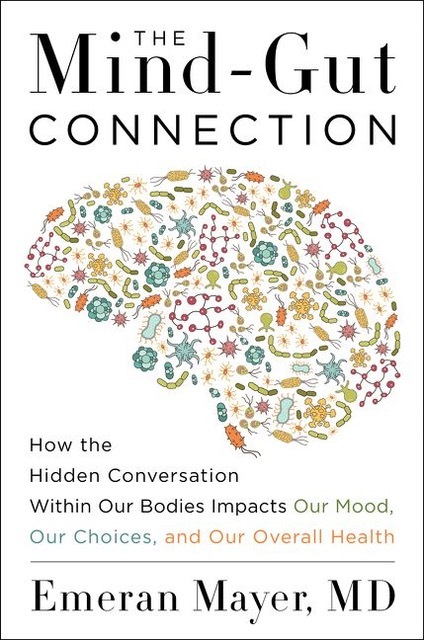 The link between your abdominal regions and your prefrontal cortex is what Emeran Mayer focuses on in The Mind-Gut Connection. A two-way street as whatever your brain conjures can have a massive impact on the flora of your intestines. Channeled through a scientific lens it is interesting to learn about the impact microorganisms in the digestive tract have and their implications, resulting in both physical and mental health problems, e.g. allergies and other sensitivities, but also mood disorders, nexus to depression, reasons for anxiety and causes for fatigue. Apart from merely shedding light on the inner workings and interplays of your body, Mayer gives also advice and tips on how to achieve equilibrium, how to boost one’s immunity system and how to shed some pounds with minimal changes to your diet. Based on sound research, this is not a medical book per se, but one that caters to both inducted luminaries and also curious newcomers with profound knowledge about their inner working yet to be acquired. Accessible, informative and certainly not lacking impact – I cannot see anyone who has read The Mind-Gut Connection not questioning what and why they input into their system. It serves as a reference book and starting point to enhance your overall well-being in a holistic manner.